This book is a study of the people of the people of nomadic groups or clans of Central Asia from about 6000 BCE to the last millennium BCE to explore why cultures and history developed the way they did in Central Asia by taking up the Indo-European and other settlements  notably, the Greeks, the ancient Iranians and Indo-Aryans of the Indian subcontinent  for in-depth study. 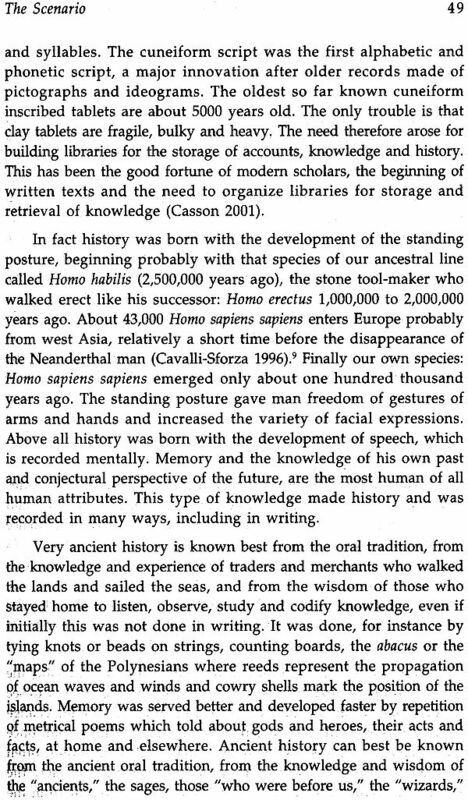 It deals with the quest for knowledge which led to evolution of cultures from simple primitive life to a society complex in structure, from philosophy to religion. The study of gods and heroes examines stories relating to migration and settlements and the geography of ancient civilizations. It is in this setting that their unique philosophies and religious beliefs flourished, giving rise to belief in numerous god and heroes. 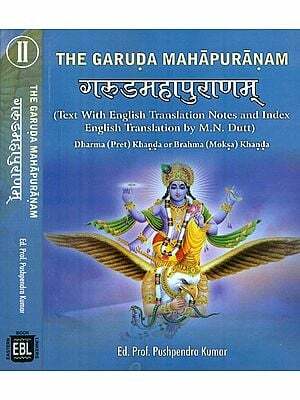 It discusses the myths and legends of the ancient cultures, highlighting names, deeds and events relating to honoured gods and much-praised heroes. 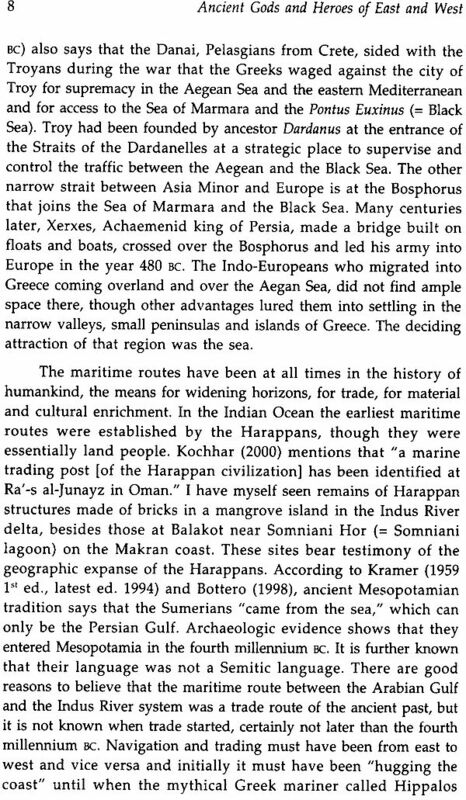 Dr. Marta Vannucci significantly concludes that both Indo-Aryan and Indo-Iranian people had been able to maintain their traditional customs and habits backed by technical developments up to the last centuries BCE. Throughout, she bases her observations on reliable information provided by archaeology substantiated by oral and written traditions of Central Asia, Greece and Rome. The volume will be invaluable to scholars of history, anthropology and archaeology who are keen to systematically unravel the obscure origins of the great human civilizational march. Dr. Marta Vannucci is a globally distinguished biological oceanographer who has been UNESCO's Senior Expert (Marine Sciences) and was a member of oceanographic research cruises in the Sough Atlantic and Indian Oceans. She has been engrossed in studies in the libraries, archives, museums and universities of Florence, Italy and Indian aided by a grasp over almost all Latin and Greek derived languages, English and German. She has been honoured with the prestigious Grand Cross of the "Order of Merit in Science" of Brazil. She is Italian born and has been resident in India since 1970. 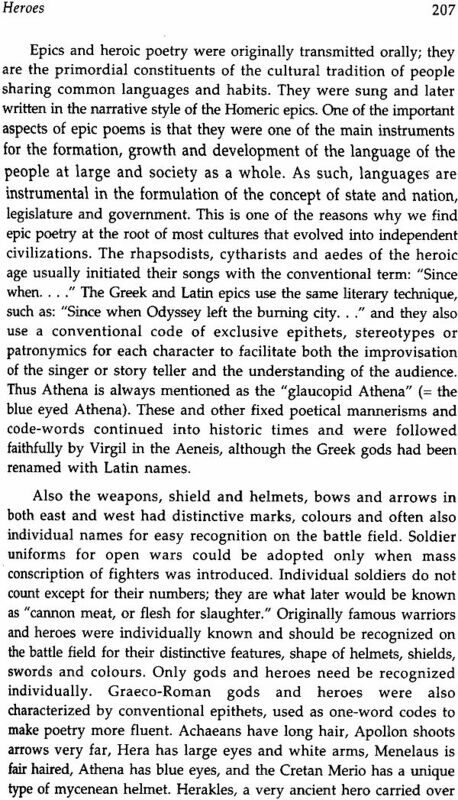 The serendipitous discovery of familiar Indian traits and names on ancient Greek vases from Attika, was the starting point of a research delving into the question of the transfer of cultures between geographically distant civilizations. The first results of the studies were published (Vannucci, 1999b) in the annals of the Bhandarkar Oriental Research Institute. The study focused on the geographic spread of cultivated hexaploid wheat, or bread wheat, the commonest species of which is Triticum aestivum, over a vast area extending from Greece to India. From the "Fertile Crescent" where it originated as a natural hybrid not later than 6000 BC, it reached Greece towards the middle of the second millennium BC sand perhaps earlier. The overall conclusion of the first study was that "it should have taken a very long time for hexaploid wheat, a natural hybrid, to spread spontaneously to far away geographic places; hence the important role of cultural exchanges." 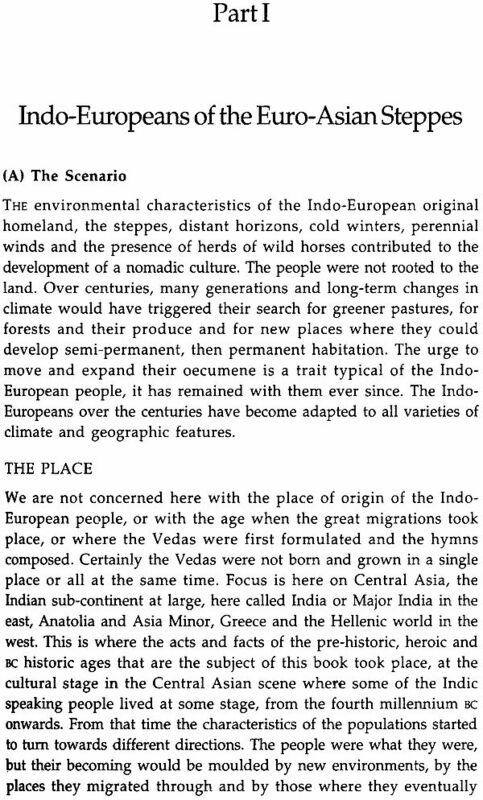 The present study is a continuation of the search for common cultural traits, material or behavioural, between people with a common Indo-European ancestry but widely separated geographically- India in the East and Greece and the Hellenic world in the west. The study has been a fascinating journey into the past and the finding of survival of ancestral characteristics and habits into the present. I will try to relate my findings into as succinct a form as possible though the abundance of material could be the matter of several volumes. This book started as a short note to be published as a paper. 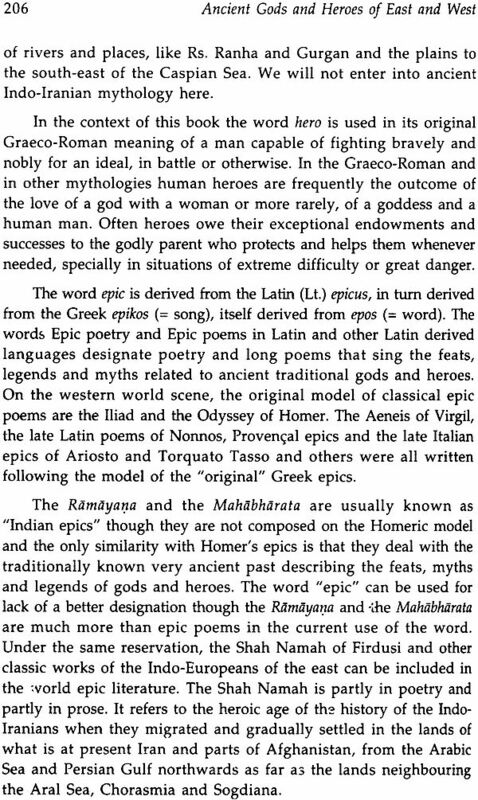 It is not meant to establish a link or correspondence between Vedic and Hellenic gods and heroes. It is essentially meant to show substantive similarities between ideas, concepts, rituals and celebrations of different people, inherited from early prehistoric times. 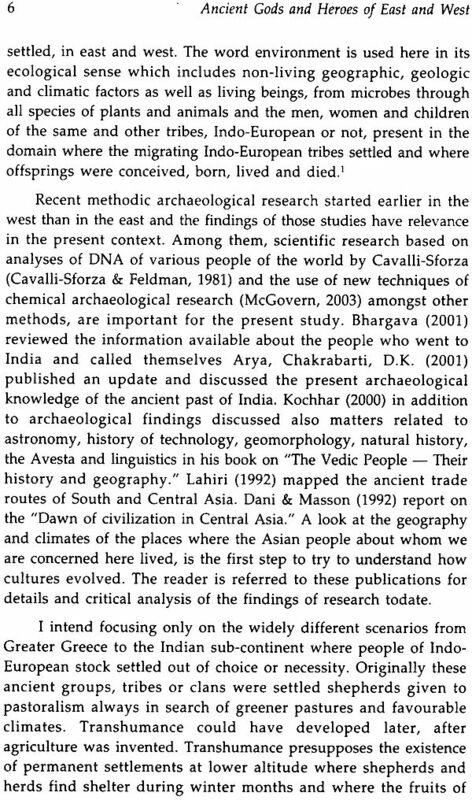 The study also intends to analyse how different environments and contacts will people from different stocks caused divergence of the philosophies of East and West. Perhaps the reader will find some bias in the approach followed, inevitable as it comes from a professional researcher in scientific ecology. No clear-cut limits can be drawn between basic attitudes and thoughts of East and West Indo-Europeans. 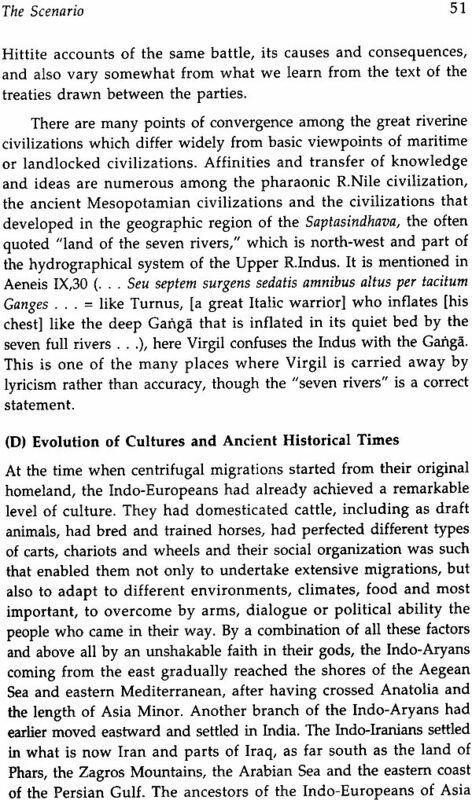 The cultural traits of each group were modified to a certain extent by mixing and exchanges with people of different extraction who were the earlier inhabitants of the lands into which they migrated. 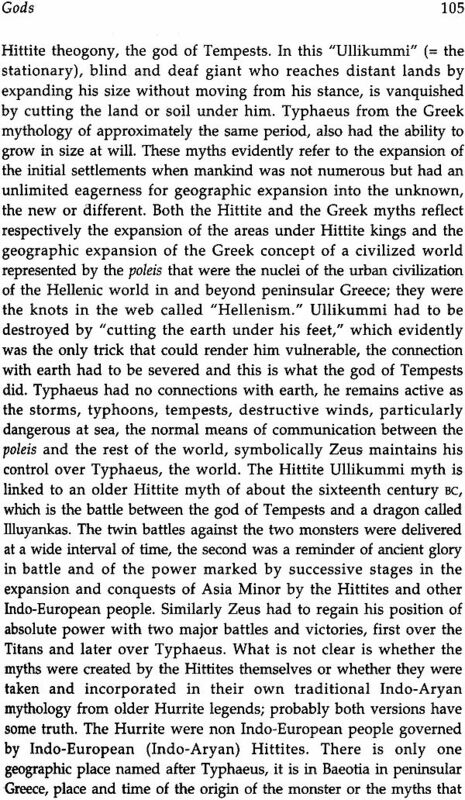 However I believe that the study provides sufficient elements to identity ancestral ideas and customs that engendered the gods and myths of East and West. Inputs by pre-existing cultures into the newly arrived immigrants can be identified since they are present in one group and not in the other. The mixing of people of various origins produced a cultural synchretism at variance between East and though many of the difference can also be traced back to environmental and historic factors. An attempt is also made to identify the causes of the divergent evolutions in East and West. Since evolution also means diversification and differential development, no attempt is made here to "recognize" the counterparts of gods and heroes of East and West. 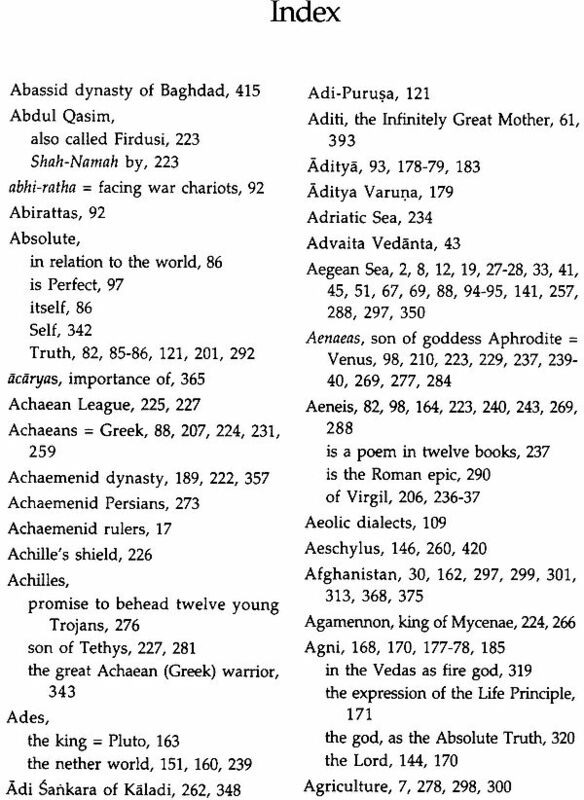 Indeed it is not possible to establish pairs of gods, one Indian or eastern, and one Greek or Western. 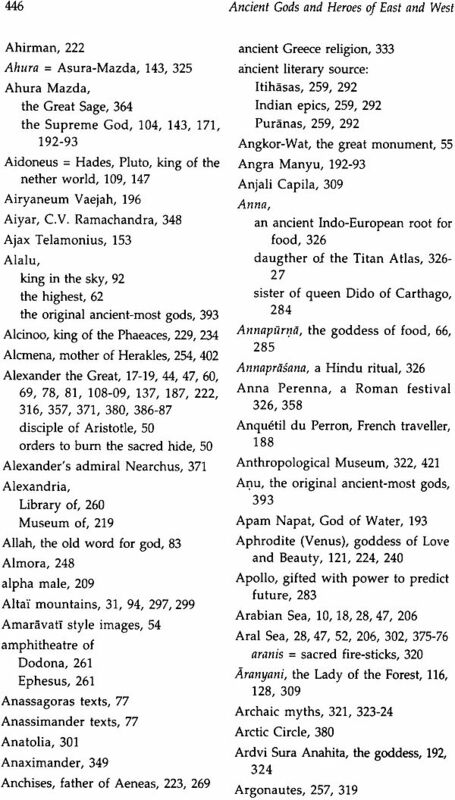 There never is an exact correspondence, though Western authors have attempted, always unsuccessfully, to match pairs of gods and goddesses between East and West. What I do find is a meaningful parallelism of habits, gestures and techniques, as well as concepts and ideal representations of gods, though not their behaviour. The urge to participate in the cosmic drama when philosophy becomes religion, what Dandekar so aptly called "participatory magic," can be clearly perceived in cultic practices, ceremonies and rituals in East and West. Participatory magic is that which takes man from a being subservient to his god to a being who participates in the life and dynamics of the cosmos, as in the Vedic sacrifices, in the celebration of the Greek Mysteries or in the Eucharistic in the "sacrifice" of the Christian Mass. 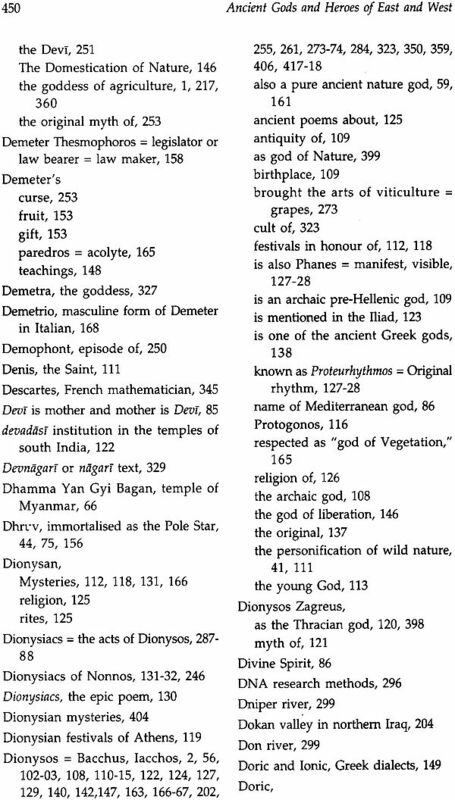 The passage from philosophy to religion was discussed in the West by the principal schools philosophy of ancient Greece, the Stoics, the Epicureans, the Academicians, the Cynics and others, as summarized by Cicero in several studies, the most important being the "De Natura deorum" (= On the nature of the gods). At this time I will not enter into the discussion of other faiths and works, as for instance the imprint of ancient Semitic cultures on Christianity and tendencies of Catholicism. Christianity is not of Indo-European (IE) extraction or nature and it inherited fatalism from Judaism which became even stronger under Islam, where the word itself means "total submission to God." 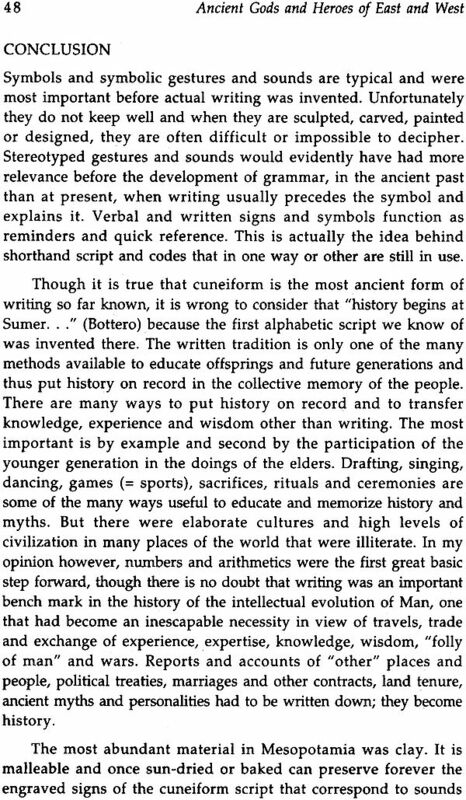 It took a long time for the West to accept partially and reluctantly the concept of the Liber arbitrium of the individual person. On the other hand, this was a subject rarely discussed in the East since it is an intrinsic idea of the concepts of dharma and karma. 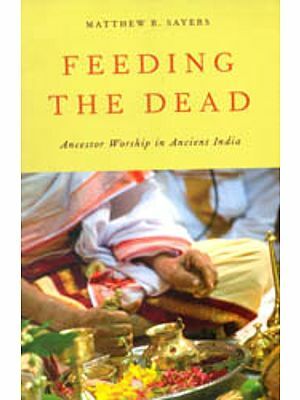 This book refers exclusively to Indo-Europeans of East and West. 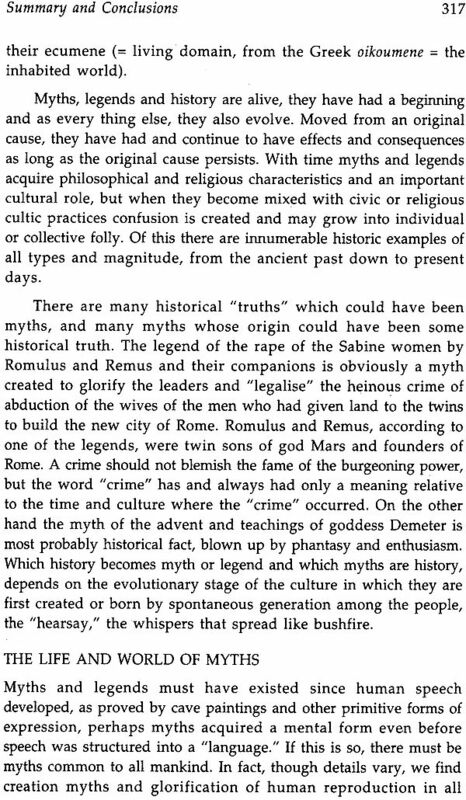 Parallelism of myths and legends, specially of the early stage called the "heroic age" are obvious, but no identity or superposition of divinities or heroes is total and complete. 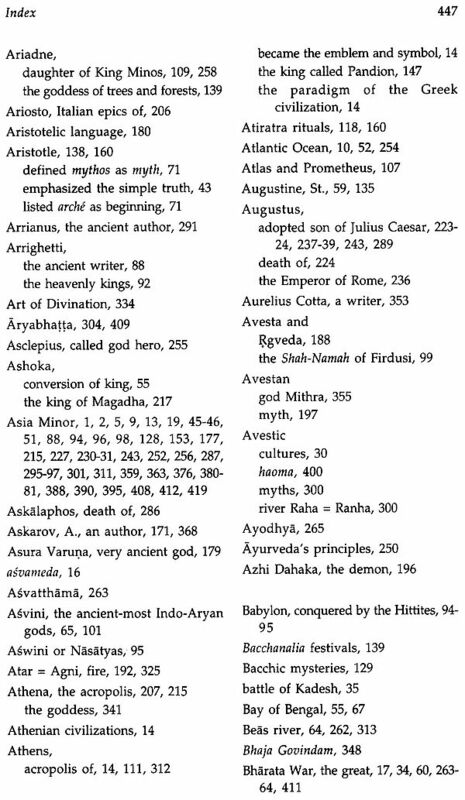 The only general similarity refers to major nature gods, Dionysos and Demeter in the West and the abstract concepts of the Hindu Trinity in the East: Brahma and Sarasvati as life and Knowledge, Visnu and Laksmi as Beauty and Wealth and Siva and Parvati as Action and Grace. As Dionysos and Demeter cover the entire existence of material life-sustaining reality, so does the Hindu Trinity cover the understanding of the material and immaterial reality of all aspects of the life of men, women and children, in their intrinsic quality of creation, maintenance of nature's cycles and recycling or matter and energy. All of these are life-dependent virtual realities linked to the essence of Life without which nothing could exist (Vannucci 1999 c). On the other hand, the eternal human quest for immortality has no parallel between East and West. In the East, immortality is achieved through great deeds of knowledge and wisdom, the ancient seven sages are deified and in the Indian tradition they live forever in the mind of man as the stars of the constellation of the Ursa Major. In the West man was influenced by Egyptian and Semitic beliefs, immortality of the body was sought but could not be achieved, and man felt frustrated ever since. 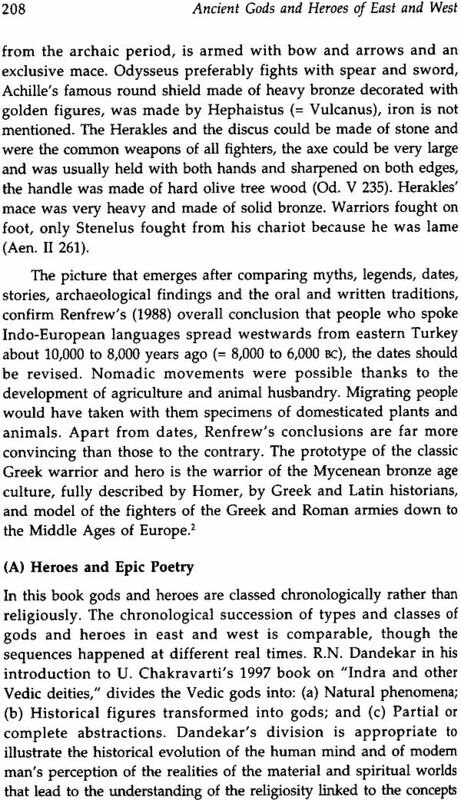 More space in allotted to the discussion of western Indo-European gods and heroes for the simple reason that the myths and legends related to Vedic gods and heroes are well known in India. 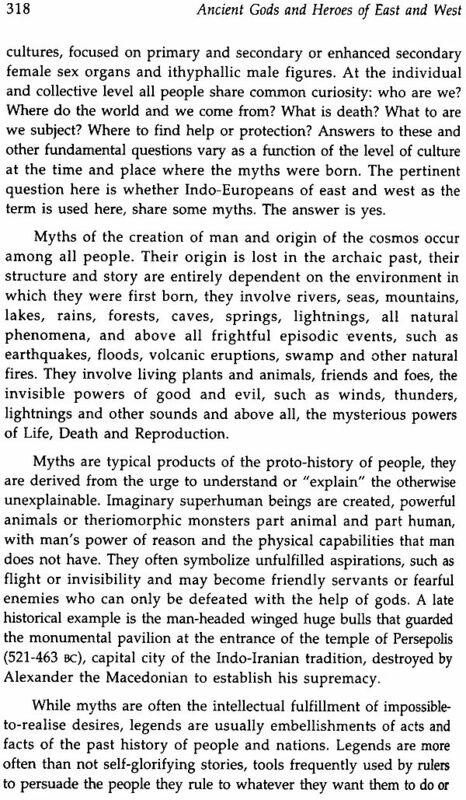 To understand the full meaning of legends and myths it is essential to trace back their origin to find out how and why they were first created, what the background and environment that generated them was, what the symbolism and meaning under the beliefs and habits were of that time. 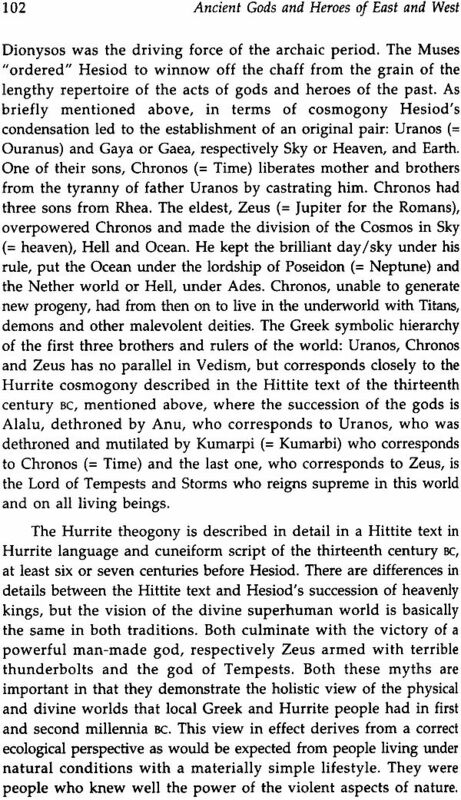 It is for instance meaningful that archaic Rudra is "howling" and that primordial Dionysos is "noisy". Both were originally identified with the strong destructive winds of the steppes and of the mountains. Winds are overpowering forces to be respected, especially when nomadism was the rule and early settlements were precarious shelters. Also the primordial God of Mesopotamia was the God of Tempests. 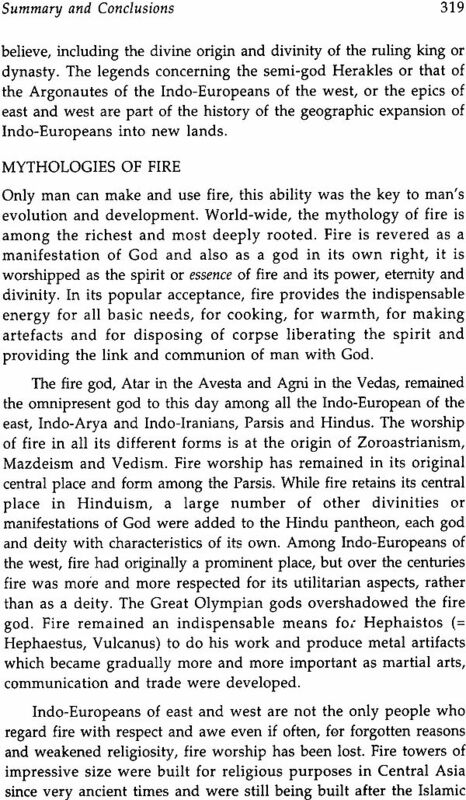 The Sun is everywhere recognised as the Life-giver and is described as "beautiful" generous and joyous" (St. Francis of Assisi) while fire, Lord Agni, gives light, warmth, and cooks food for better nutrition and is everywhere revered as the "most ancient." 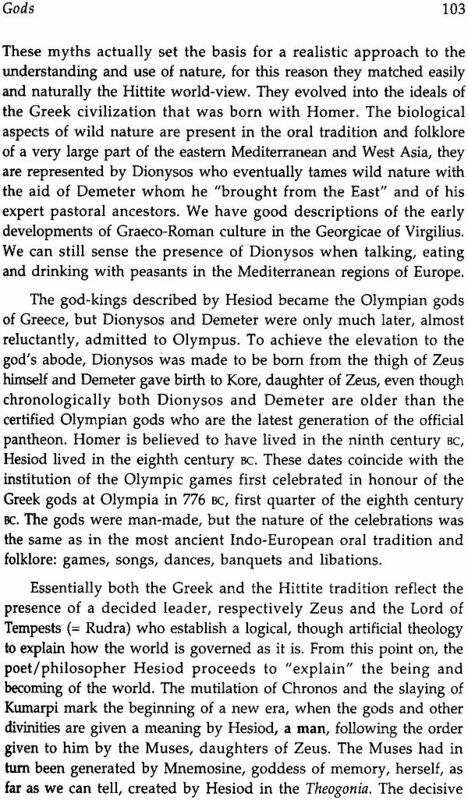 As planned at first the book would include studies about Dionysos, Demeter, Visnu, Varuna and the common man and woman. 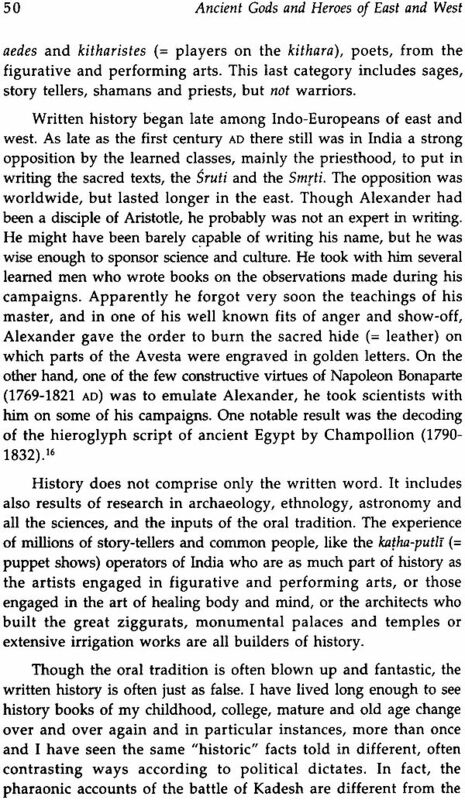 The book should also include studies of the traditional heroes: Perseus, Herakles, the Pandavas and perhaps Hanuman, but it soon became evident that such an extensive enterprise should best be broken up into parts. 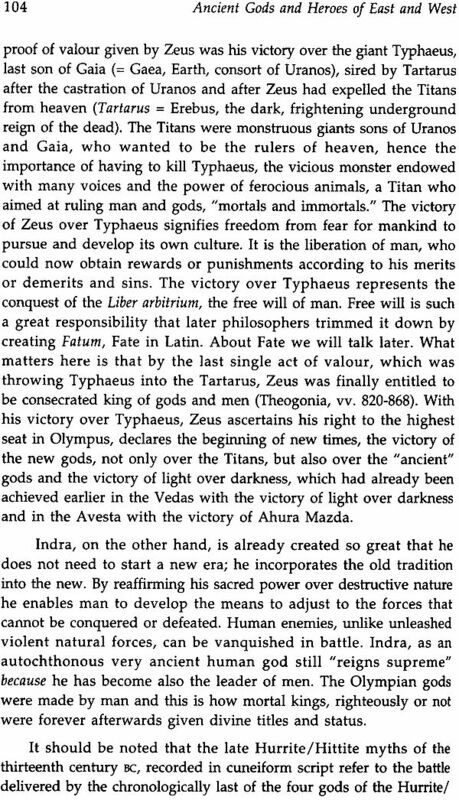 We will deal here only with the Greek nature gods and some of the heroes of the Greek epics. 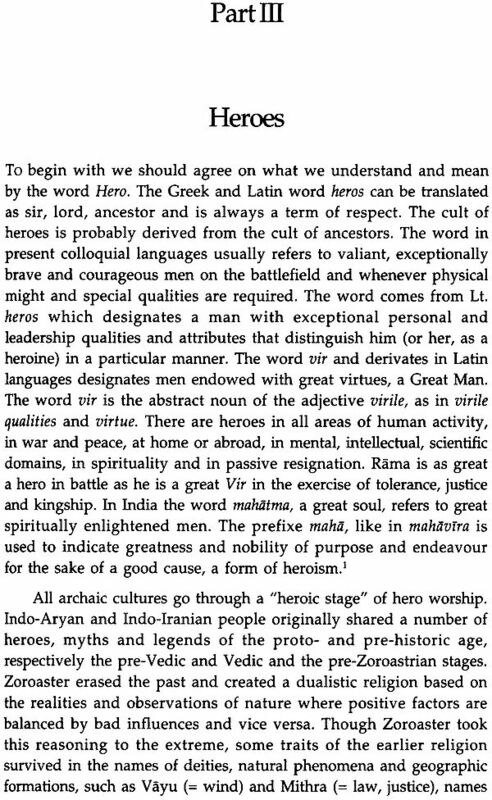 Briefly we shall also deal with some of the Vedic gods and heroes for the sake of comparison. 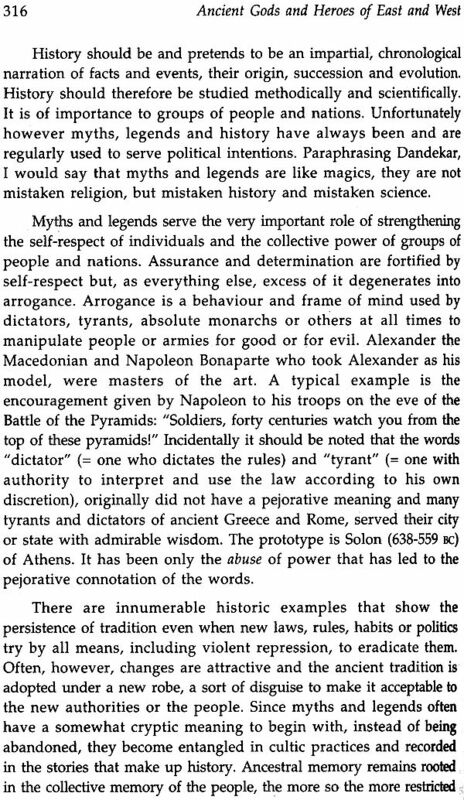 I offer apologies for what could appear to be un-necessary repetitions, but such a complex subject as dealt with here needs to be considered from as many viewpoints as possible, hence the repetitions of acts and facts as seen from different angles. I am deeply grateful to my many Indian friends of different sorts who helped me understand the meaning and thinking of the Indian way of life, its tolerance and faith, first among them the late Dr. Meenakshi Iyer. I am grateful to Dr. Rajesh Kochhar for the time he spent in fruitful conversations and for his constructive criticism. To Dr. H.K. Kaul, Director of the Library of the India International Centre in Delhi, I am indebted for the constant and free use of the library and its facilities and for the personal assistance given by Smt Sushma Zutshi in particular and all the staff. I am grateful to Dr. M. Cristina Guidotti, Director of the Egyptian Museum at Florence, Italy; to Dr. Marco Piccardi, Curator and Dr. Monica Zavattaro, Deputy Curator of the Anthropological Sector of the Natural History Museum of the University of Florence, Italy; and to Prof. F. Pecchioli Daddi, Professor of Egyptology at the University of Florence, for their generous and learned interaction. I am grateful to the National Library at Florence and to the Biblioteca Marucelliana, Florence, for their always prompt assistance and collaboration. To Mr. Ali Hooshmand, many thanks are due for the use of his personal library as also to my friend Jennifer Haslett for her patience and always interesting remarks. Last but not least I am extremely grateful to Prof. V. Giannellini of the University of Florence, for his unfailing help, constructive criticism and expert technical support. Last and most important I wish to aknowledge the unfailing help and support received from Mr. Susheel Mittal on which I could always rely to report on the results of the studies of many years in different Universities and Museums in India and abroad. Author has spent a lot of time collecting information but has not really tried to make a logical case for the conclusions arrived in the book based on that information. Instead, again and again, the book gives the impression, that the author is trying to use the information presented to paint an already existing blue print/world view. If the author had tried to make a scholarly attempt to go with the information alone, many of the conclusions either can not be reached or worse, can be used to disprove the very conclusions reached by the author. The book was an interesting read but very disappointing to see the author present information leading to A != B but concluding A = B. 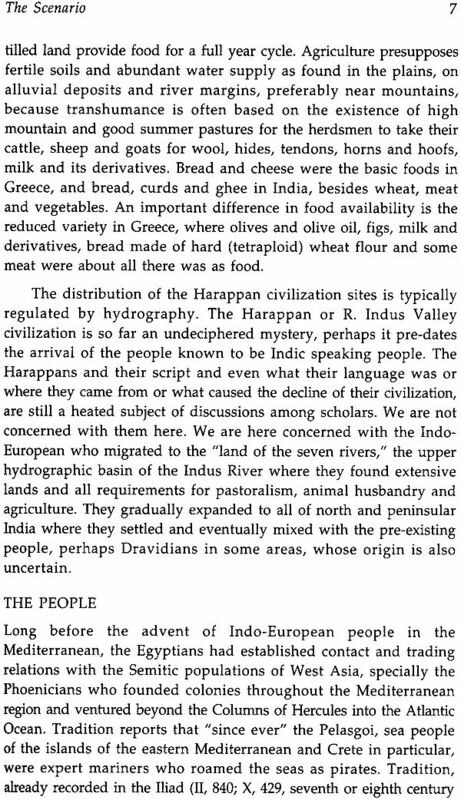 An opportunity lost to stay in line with western view of origins of vedic and avestian cultures! !